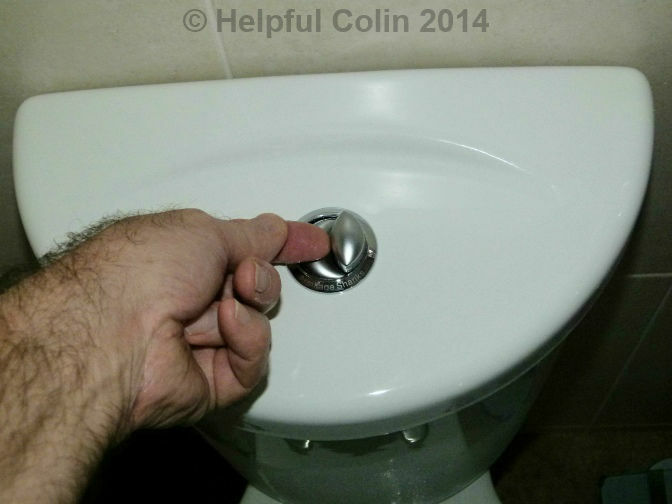 How to achieve dual flush toilet cistern lid removal on my Armitage Shanks1 Ascania cistern. Start by extracting the two buttons from their socket. Push one button down all the way and keep it down (the toilet will flush). Turn your finger so that your fingernail engages with the side of the other button. Both buttons have a finger nail notch on the side. Dig your nail into the notch and pull out the button. The button will click out of position ready for removal from the socket. My buttons have a long thin rod of plastic attached which reaches down to operate the real buttons inside the cistern. Be careful not to break them. 1. Pressing down the Large Flush Button to engage fingernail with the Small Flush Button. 2. Clicking it out with a fingernail. 4. Lifting it a long way up. 5. The Small Button taken out. Now with your forefinger of the other hand engage your fingernail in the other button in the same way and pull it out with a click. Look into the socket and you will see a plastic screw that has up to now escaped you. It is the one that holds the lid on. It shouldn’t be over tight. unscrew it anticlockwise with a screwdriver having a wide flat blade 1mm thick. Don’t chew up the soft plastic of the screw. The button socket mounted through the lid has no thread in the screw hole. The screw is just a tight fit. The thread into which it screws is in a flat plastic Sliding Plate held aloft by a frame, referred to as a bridge, attached to the flushing module/valve below the Button Socket. See the detail below. With the screw removed the cistern lid should lift off and the Button Socket can be removed from the lid by pushing it out from underneath. Wash and clean all parts before reassembly. NOTE: Cleaning fluids running into the Button Socket drain through holes into the cistern for flushing away. See the cistern below with the lid removed and the internal parts labelled. The Sliding Plate in the Bridge (height adjuster) moves around horizontally so that its holes align with the Button Socket in the lid. Be careful not to accidentally push the Bridge down. It ratchets down easily but is hard to draw back up. Ultimately it needs to sit just below the Button Socket. The Sliding Plate also has two holes through which the Button Rods3 pass on their way to engage with the real buttons below. Align the holes in the Button Socket (silver cup) by removing the rods from the buttons and using them to keep the holes aligned while tightening the screw. NOTE: If the cistern lid has been pried off (or just forced upwards) by someone who doesn’t know how it is held in place the Sliding Plate could be cracked or broken and will then need replacing2. To flush the cistern with the lid removed poke something suitable through the holes in the Bridge’s Sliding Plate and use it to push the flushing buttons down, e.g. use a button with spindle attached, a screwdriver or press with a finger where space permits. 1. Armitage Shanks are now part of Ideal Standard. For other suppliers search under GEBERIT, TWICO, Ideal Standard or Amitage Shanks. These parts may also be available from builder’s merchants, DIY stores and hardware shops. 3. Button Rods are cut to length according to the size of the cistern that the flush valve is installed in. The rods are hollow and so stainless, brass or nylon screws may be inserted into the bottom of the rods to make their length adjustable, particularly if they are cut too short. Thanks, Brian, this has had me stumped! I presume you’ve now got the lid off. Hi there, I removed the small and large button but no spindles came out with them (I haven’t got your make)? Although I am not quite sure what is wrong with the toilet as we have just moved 2 weeks ago and was working fine but now seems to fill up very slowly? Can you help me please? Have you got the top off yet. Once I take my buttons out I can look down into the silver cup they sit in and see the head of a big white plastic screw. I then unscrew it with a big wide flat blade screwdriver. Use one big enough and you won’t damage the plastic of the screw head. Once that screw is out I can lift my lid off. Please let me know if you make progress or not. Have you made any progress removing your cistern lid? •	The float staying up when the water level drops in the cistern. This could happen if calcium built up on the parts, removal being the solution. Apart from chipping and scratching it off with various tools you can try to dissolve it with Betterware Multi-Use Descaler. •	A stop tap, specifically for the toilet, partly turned off. You can see the type I refer to in my post Toilet Silent Fill Valve Repair & How It Works. Work the stop tap if you’ve got one, i.e. turn it off and on again in case any debris has built up in it. It may be only turned on a bit to restrict the flow. Set it where you want it when you’ve worked it. While on the subject of stop taps, is the main stop tap for your property on sufficiently. If you’ve just moved in you may want to find out if it is in good working order, doesn’t leak at the spindle and fully on. Also will it turn off and stop the water flow when you want it to. Don’t break it by forcing it if it won’t turn. You won’t want a gusher. •	A blockage due to pipe damage, e.g. a 15mm copper pipe feeding a flexible connection to the cistern projects through a hole in a wall at a low level and someone has stood on it and bent it so that it has flattened and hardly any water can get through. •	I have seen fill valves that are supplied with a restrictor which screws inside the input orifice of the valve to reduce the diameter of the input from 15mm to something much less, say 5mm. This makes the cistern fill more slowly and quieter as a consequence. That smaller hole could more easily get blocked by debris from the water supply. Is your cistern supply from the mains or a header tank? The latter being more likely in a high rise block. You’re more likely to get debris from a header tank. Many thanks for the info but unfortunately the wife had a go and balled things up!! Both buttons are out, but no spindles nor screw visible (I could email pics if you want). I can’t even put the buttons back as the “catchment” for the small button is not visible! So now I am completely stuck and a shout for a plumber is due tomorrow! Sorry to hear your having difficulty. Yes, please send pics. I might learn something. I have unfortunately only dealt with my own modern cistern, but I think some principles are common. By that I mean gravity usually holds the top down on porcelain cisterns but the buttons have got to be well aligned to operate the parts inside so they have to be screwed or clipped to them to work. It is as a consequence of this that the button mechanism holds the lid on. Otherwise we would all be able to just lift the lid to check what’s going on inside. I’m very interested to know what is inside the cup that holds the buttons. So many plastic things clip together these days. Knowing how to undo clips without breaking them makes life a lot easier. Is there anything else in the cup besides the buttons that is removable and covering up any clips or screws? Good luck and watch how the plumber does it. Thanks Colin,it is most helpfull now to try and get it to work. Thank you Colin! I had broken mine and couldn’t work out how to put it back together but you have saved me a lot of hassle and frustration! Well if you just had it fitted I’m sure you can ask the plumber to take a look at it. He must surely guarantee his work. I am not familiar with all types of button. They don’t all work the same way or fix onto the cistern in the same way. Whether you ask me or anyone else about this I’m sure photographs of the problem will help you to get an answer. Thank you so much. I could not figure this out at all. Hi Colin, I have basically the same problem. I tried to take off the buttons on top but think I may have damaged them, (I was trying to fix the water still flushing for a long time after I had flushed the toilet) it looks like the casing for the buttons has snapped and the rest of it is inside the cistern. I can’t take the lid off the cistern as it all seem to be all part of the cistern, its not silicone on. I now don’t have any toilet to use, unless I use a big bucket of water to flush it. I’m sorry to hear you have this problem. Since I am not familiar with your cistern and I am not a regular plumber I can only advise you to employ a plumber to fix this. If you don’t know which one to choose I recommend you search for one out of your local council’s Trusted Trader list. You should be able to see it on the internet. I managed to remove my buttons (I have an Imperial porcelain toilet), but the head of the plastic screw doesn’t have a gap for a screwdriver to open it. For lack of a better way of explaining, the head instead looks like a Phillips head screwdriver bit. So it’s the reverse and unless I used extremely thin long-nosed pliers which I can’t seem to get, I doubt I could grasp the head? Do you have any ideas of what I could do instead please? That thing like a Philips screwdriver tip might be a peg sticking up through a hole with some splines on it which need to be squeezed together to release it and extract the button cup. 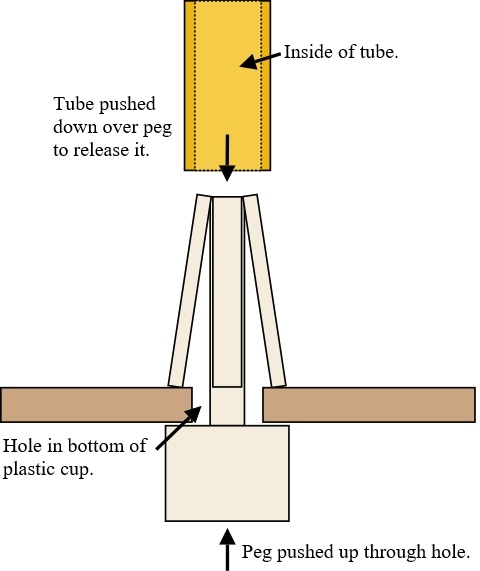 Here is a diagram showing how the correct size tube could be pushed over the peg to squeeze the splines together all at the same time so they will pass back through the hole. If you don’t have any suitable tubing try a wooden dowel with a hole drilled in the end. Sorry if my previous explanation sounds silly and you are convinced it is some kind of screw, then please try to photograph it and send me the picture. Thanks colin. Im Ashwini from india. I was not able to figure out how to do this. Your blog was a great help. Thanks again and god bless. I’m glad to have been some help to you. I have Toronto BTW close coupled toilet and cannot get off the cistern lid. I have pressed down the large button there is no way to get a finger nail or small screw driver under other button so frustrating. Sorry but I haven’t yet found a solution to your problem. Hi. I dont know if I will get a reply. However I took my buttons out. The rods had screws in which inverterbly attached it all regardless and I could not get these past the ‘sliding plate’. My sliding plate unfortunately had a massive crack within, so me trying to pull the rods caused these screws to impact on the plate and cause it to break. Is this crucial in the construction of the toilet button lid bit? If so any idea where I can get a new one? Thanks. The plate you mention has a hole in the centre with a screw thread to receive the plastic screw which holds the silver cup for the buttons in place. The screw and cup together hold the cistern lid down. The plate has probably been cracked by either over tightening the screw in the silver cup or (more likely in my opinion) by someone not knowing how to remove the cistern lid and lifting it up with force to try and remove it. There will be no way to hold the cup and buttons in their correct location. The lid will stay in place due to its weight. The buttons will be available to be pressed down and used, but they will be free to rotate and if they do the rods may engage the wrong buttons below or bridge across the gap and operate both buttons and just generally be a problem. You could remove the plate and try gluing it with a solvent based adhesive for that type of plastic but you would have to be very delicate when tightening the cup screw in the future. Of course the adhesive might block the screw hole if the break passes through it. A new part would be ideal. You would have to buy the complete flushing mechanism and replace all of it or just use the new plate. To get a new part you can search the net, visit DIY or hardware shops or builders/plumbers merchants. If I come across a good place I will let you know. yeah it does seem that to be the reason. and frankly it doesnt look like theyve been ever changed. though my grandparents assured me it was last year. i think the builder has damaged then. the buttons, rods and button holder are much older looking than the cup part. however did work to it last year has actually put screws at the end of the rods. unsure why so going to purchase some new buttons with rods. i completely can understand now the reason for the sliding plate i didnt think of it how you mentioned. so you cant just buy a new sliding plate? Maybe the screws in the end of the rods are to make them longer. If the plumber cut them short or found they were causeing the problem because they were a bit short then the screws in the end (which presumably can be adjusted to stick out more or less) may have solved the problem. Making the rod length adjustable is a good idea. However, and only for the past couple of days, its almost as if the flush isnt fully flushing to the point its taking 3 or 4 goes to get tissue down…? Any ideas. Ive relooked at it all. At first i thought was the floaty not filling up which still may be an issue. But watching it flush and drain it only went down 3quarters and not fully empty. Any idea how to fix? Sorry to here things aren’t going so well. 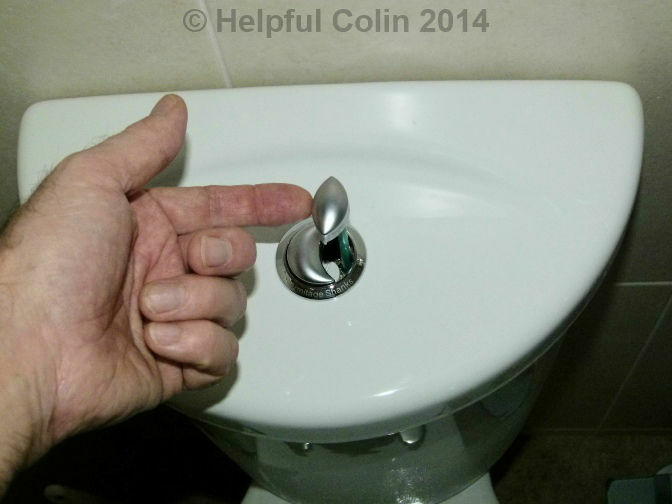 On 7th July you said, “Unfortunately the bit fallen off did actually drop down and kind of flushed away.” Well that ‘bit’ may have got sucked up into the works of the flushing mechanism when water flowed out of your cistern and be causing the problem you have now. This has turned into a big problem but you may be able to fix it if you remove the valve so that you can see if something is broken or jammed in it. Ultimately you may have to replace it. Look at this video for help: How to fix a push button cistern, that does not flush, without removing the cistern. It’s not the best video and the plumber in it should use a bigger screwdriver so he doesn’t damage the plastic screw. Also the first valve he demonstrates has a broken clip for holding the valve in place. You may spot it. You may also like this video showing a different flush to mine but it may be like yours: Toilet cistern still running after flushing? where do i get a new sliding plate? Sorry I cannot give a good reply just now but I will study your problem and give a better reply later. Because I am not a regular plumber I haven’t met too many types of flushing mechanisms. Your mechanism doesn’t sound like mine. Maybe the whole prong thing unscrews. My advice is to look carefully at your flushing mechanism parts that you can see and try to ID the particular one you have by using Google Search to search for Images. 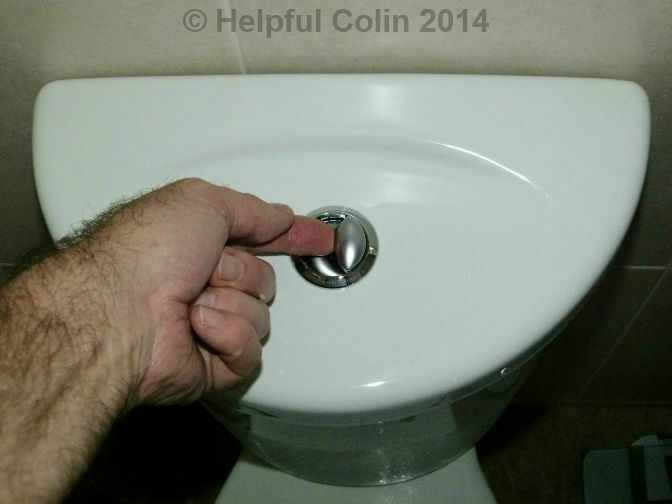 Use search phrases such as ‘dual flush’, ‘toilet flushing mechanism’, ‘toilet buttons’, ‘dual toilet buttons’, etc. If you are lucky enough to find yours make a note of the brand and type by looking at links from the picture you have found and re-search for more images and information on that particular one in the hope of finding your answer. Another method might be to visit a plumber’s merchant and show them the parts you have extracted and ask if they can ID the mechanism. I’m sorry I can’t give better help. Trying to lift off the WC cistern lid, I have removed the large and small flush buttons, but there is no screw head below. There is what looks like a screwhead but it has no slot for a screwdriver. Would you glad of your advice. Sorry my reply is delayed. I mentioned this to my nephew and he immediately suggested something I too had thought of. They come in many styles. If that’s what you’ve got you may have to try and pull it out with long nosed wiring pliers. Something might get broken so good luck with that. I decided to take a photo of the WC cistern with the flush buttons taken out, so that you can see what it looks like. it doesn’t really look as if there’s room to pull anything out. Is there any way I can send the photo to you? David, you can send a photo to helpful.colin@btinternet.com please. When having unscrewed my top dual flush out of the cistern lid I find that it’s an all in one with a rod connected and a smaller rod inside which moves freely. All I did was unscrew the dual flush and then put it straight back in but now the two buttons have dropped like they’ve just been pressed and they won’t come back up! Are the two rods you mention for the small and large flush or are they for one of the flushes and therefore need coupling together with a plastic tube so that pushing one down pushes the other down below it? Have some parts come adrift and fallen in the cistern? You can send me a photo to helpful.colin@btinternet.com if you want. Hi Colin, Thank you for taking the time to reply. I’ve actually sorted it now but it was a rod within a rod and they push the buttons back up when the syphon rises. I think what you need to do is to get your thumbs onto the central shaft (the circular metal shaft) and turn it anti-clockwise. This will release it from the flush unit beneath, which it is screwed into. You should then be able to lift the metal shaft out, and then the cistern lid will lift off. I didn’t know what a ‘sliding plate’ was, but I knew it was broken. Thankfully, your site showed up in a google search, and now I can order a replacement. Thanks much! Hi Colin, I found your explanation to be very helpful and it solved the problem for me. I’ve read through the other comments too and see that you go out of your way to help others, despite some of the posters being rather demanding! Well done for that Sir, you have my respect and I’d like to wish you and your family a very happy Christmas. Best wishes for a prosperous 2017, Jim.
. . . And a Merry Christmas to you too Jim. With kind regards from Helpful Colin. That cistern had me scratching my head as to removing the lid. I have read everything in your blog, and I want to ask you this, why the heck has cisterns become so complicated ????? I had trouble with mine after I moved in, managed to get into the cistern, but failed at putting it all back together again. Two hours of sweat and backache later I gave up and my son had a go. Even he found it very difficult, and he is a professional engineer! I now have a cistern with a very loose dual flush button; it works, but dangles about and I darent touch anything else. I would have liked to be able to put a bleach block in though !!!! I’m sorry to hear you had so much trouble. I think the main reason for modern cisterns being like they are is: People require them to fit into smaller spaces than they did years ago. Fill valves had a long arm with a big ball float on in the past. That took up a lot of space. So now these have been compacted into a much smaller volume. Then there is the requirement to save water by not flushing large amounts down toilets. That led to there being a choice between a large or small amount of flushing water. Consequently you now get selection buttons and complex mechanisms instead of leavers to actually move water about. Also people want to have hidden cisterns and remote buttons. These all add to the complexity. I suppose a bleach block interferes with the volume of water. When it’s used up you’ll want the water level to be where the manufacturer intended. When the block is new you’ll want the water level to be slightly higher. Then you’ve to keep removing the lid to replace it. I think you buttons must be a different brand or model to mine. Other people have removed buttons and not found a screw. I suggested that in the absence of a screw someone has inserted a plastic stud to hold the silver cup to the apparatus underneath. Is there anything like a stud in the middle? The silver cup could be moulded in 2 pieces which screw together. You’d have to look very close to it to see if there is the end of a screw thread anywhere. Sorry I’m not much help. There are many different types of flush mechanism. You’ve only got to search the net and you’ll find dozens. I’ve been trying to work out how to get my damn cistern lid off for a couple of years, so I can put a bleach block in there! Thank you! That was really helpful, Colin. Thank you! It helped me so much. Clear pictures and instructions. My brand is ROCA and it used a Philips head screw but had the same general construction.